For the fifth time hundreds gathered for a memorial service at Moscow’s Avtozavodskaya subway station to commemorate victims of the biggest terror act in the history of Moscow’s underground. 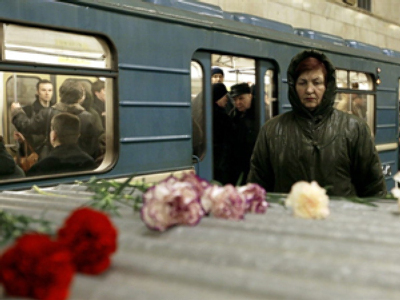 Friday, February 6, 2004 will forever be remembered as a tragic day for Muscovites. Two bombs exploded at the peak of the morning rush hour killing 42 and leaving more than 250 people injured. A suicide bomber was in the second carriage of a packed train, with his deadly cargo – equivalent to 2.9-6.5 kilograms of trotyl – supplemented with screws and bolts in order to maximise the damage. The bomb went off around 8.32 AM, when the train had just started from Avtozavodskaya to Paveletskaya stations of the Green (Zamoskvoretskaya) Line. Though the blast triggered a massive fire, decisive and cool-headed action by the train’s driver, Vladimir Gorelov, prevented panic among the passengers and kept the number of casualties at a minimum. “Within a minute after we left Avtozavodskaya I heard a loud clap, my side-window broke, I immediately used the emergency brake. We halted after just 300 meters. My first thought was that something is wrong with the train. Then a passenger from the second carriage told about the fire through a microphone,” Gorelov recalled in his numerous interviews. In strict accordance with his training, Gorelov told the traffic superintendent about the incident and asked for the electricity supply to be cut. Even with the superintendent not asking for additional clarification, it took three minutes. They seemed like an eternity for those trapped inside the train, and understandably so. By 8.40 most of it would be on fire. But if Gorelov had given in to the natural urge to let the people out immediately, he would have exposed them to a deadly 750-900 volts of electricity. So he waited. “The biggest challenge was not to mix up the microphones and let the passengers know of the fire,” Gorelov said. When the electricity was turned off, Gorelov opened the doors, telling all the passengers to walk towards Avtozavodskaya. Those in the first carriage, however, had to go towards Paveletskaya as the fire in the second carriage blocked their route to the much closer Avtozavodskaya. To most of the passengers, Gorelov’s voice sounded perfectly calm, despite his injury from the broken window and mild concussion. That calm was something the passengers needed after feeling the force of the explosion and seeing smoke outside of the train’s windows. Had panic erupted, the resulting stampede would have dramatically increased the number of casualties. “There was very little crying,” Ilya, who was in the rear end of train, recalled. “Almost none. I was impressed by the people’s cohesion. Everyone was helping pregnant women and the elderly to get out of the train. Through the dark tunnel we walked back to the station”. People closer to the epicenter of the blast and fire had a more difficult time; dense smoke made breathing difficult. Three elderly passengers had heart attacks. According to some reports, they were brought on by burning toxic materials – the train was build before 1980, when such materials were still widely used. Those who had something to put over their faces fared better on the underground walk to safety – even though they had to step over body parts scattered by the explosion. “The part of my scarf, through which I was breathing, turned completely black, as did my face,” – Darya, remembered. “It was dark and smoky. As we went to Avtozavodskaya I saw corpses on the rails; there were about ten of them. But no one panicked”. Commuters who entered Avtozavodskaya station at around 9am witnessed scenes that could have come from a zombie-horror movie. Dozens of people caked in dirt and blood were moving to the station’s exit. Being in a state of shock, their only concern seemed to be to scrub the filth from their faces. Meanwhile, less than half a kilometer away, a proper disaster film was unfolding. Train driver Gorelov and some others were trying to help those who bore the brunt of the blast – the people from the second carriage. “What I saw there shocked me deeply. It was a mixture of human bodies, blood and body fragments. Those alive found themselves trapped between dead bodies and were screaming for help. The carriage was blown up like a barrel, but there was no fire, which was reassuring”. As Gorelov checked the rest of the train, help from outside arrived. For many of Moscow’s emergency workers, February 6 became a massive test. But it was won they passed with honours. They showed determination and professionalism despite being greeted by a disturbing stream of bodies and injured people at Avtozavodskaya. Medical staff on sick leave or those who had just finished a night shift rushed to the scene to help once they heard what had happened. By 10am the fire had been extinguished and all those still alive evacuated. Forensic teams sealed off the blast site and began gathering evidence and collecting DNA samples. In a few hours they had what they needed. By 6pm the same day the Green Line on Moscow’s subway system was fully operational again. It took about a week to identify all the victims. Some who were initially thought dead were later found to be alive – to the delight of their grieving relatives. The death toll was less than initial estimates. Experts believe the overcrowded train helped cut down the number of casualties. The packed carriage acted as a living sponge that absorbed most of the blast wave. Russian police used all available resources – including their staff ‘paranormalists’ – but it took another four years to find three suspects and bring them to court. On February 2, 2007, Tambiy Khudiyev and Maksim Panaryin from Karachay-Cherkess Republic and Murat Shavayev from Moscow were found guilty of organizing the explosion. They were given life sentences. Khudiyev and Panaryin were trained in militant camps in Chechnya and organized the suicide bombing; Shavayev supplied the explosives. Vladimir Gorelov was awarded State Order of Courage for his actions during the incident. He still works as a train driver on the same line.